Ferry operator Caledonian MacBrayne has made an operating loss of £2m in the past year, according to its newly-published annual report. Fuel costs, traffic and berthing dues and the company's pension deficit all contributed to the figures. The Stornoway to Ullapool route was identified as the biggest loss-maker for the state-owned company. 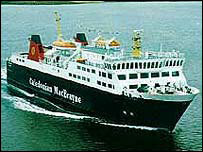 Retiring chairman Dr Harold Mills insisted CalMac was in "good shape" to face the upcoming tender process. 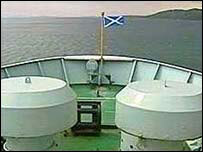 CalMac made a loss of £33m, but that was before the injection of a Scottish Executive deficit grant of £31m. Fuel costs increased from under £6m to £9.5m despite a special scheme making fuel available to the company at prearranged rates. CalMac said it had maintained the number of passengers it carried at more than five million, while it carried more than a million cars. The company carried 14,000 coaches - an increase of 1,000 on the previous year. For the first time the report has a breakdown of route-by-route losses, with Stornoway to Ullapool losing more than £4m and the Lochboisdale more than £3m. With the European ordered tendering process to come, the figures may seem depressing. However, Dr Mills said the company was in good shape for the future. CalMac is to be split into three new companies from October. One of the companies is registered in Guernsey in the Channel Isles, resulting in substantial tax savings. The RMT union said it had been reassured by guarantees that staff's pay and conditions would not be affected.